Finding opportunities to stretch in the classroom shouldn't be a challenge. Here are three ingredients of a lesson that will get all pupils, including the more able, thinking. According to Ofsted, the best teaching ‘engages and includes all pupils, with work that is challenging enough and that meets their individual needs’. As a full-time teacher, I set about collecting the activities that cut the workload while keeping all pupils engaged and challenged. I finally settled on the following three criteria to determine the most effective strategies. Are the tasks accessible? Could all pupils understand the task and have a go at answering them without long teacher explanations? Do they make the pupils think for themselves? This encourages independence and resilience with the added benefit of making my own life easier. Do they give pupils a chance to shine? Each activity was chosen precisely because they do not put a ceiling on what can be achieved. Below are three examples. I hope that you and your pupils enjoy trying these ideas out and that they save you some time so you can enjoy the rest of your life as well! Arrange the pupils in groups. Each group has a moment to discuss their strategy. They then take it in turns to ask the teacher a question to try to work out what the lesson (or a key feature of it) is about. The teacher can only answer ‘yes’, ‘no’ or ‘it depends’. The class are allowed a set number of questions (to be decided by the teacher at the start) to see if they can find out the lesson topic. This is a great exercise to really get the pupils thinking. It also encourages them to be precise with their language and to evaluate each answer carefully. They need to be attentive so that no questions are wasted, and plan their questions together so to narrow down the range of possible answers quickly. Effectively, this drip-feeds clues to the pupils who are trying to see the big picture of the lesson topic. By making this a group task, all pupils are involved and will evaluate the questions that could be asked. The teacher should keep a tally on the board of how many questions have been asked. It’s up to the pupils to remember or note down any information given from the answers. It is worth repeating this starter occasionally as pupils get much more tactical with their questions. If all the questions have been used and no one has guessed the correct answer, then groups can be given a minute to discuss it before giving their best guess. The teacher can then judge which group is closest. Put pupils into small groups. Give each group three pictures or artefacts that are related to the lesson. Tell pupils that they are the curators of a museum/gallery, who are putting together an exhibition on your chosen topic. They have the final three items but there is only space for one of them in the exhibition. Their challenge is to decide which one to keep. Give the groups a time limit for their discussion and warn them that they will have to explain their decision to the class – why is their chosen item the best representation of the theme? Group work and discussion are when the most progress is made in thinking skills. Pupils have the opportunity to support one another and play to their strengths. By making the groups justify their decision to the class they are clarifying their own ideas, backing them up with reasons and modelling their thinking process. Along with the evaluation needed, students use many high level skills for this task. You can provide help sheets with information about the pictures/artefacts to give pupils the opportunity to learn more. The task can be set as a homework so that pupils have to research the pictures/artefacts themselves before announcing their decision to the class in the following lesson. Each group can either receive the same pictures/artefacts or a different set. From planning to plenaries, the secret ingredients of a challenging lesson aren't all that secret. Use these practical strategies to get started. Show some images of things that are relevant to the lesson that has just gone before. Pupils have to explain how each picture links to the lesson content. This can either be done as a whole-class discussion, in groups or written into their books. To make this more challenging, include a couple of images that are not obviously related to the lesson. If re-using pictures shown earlier in the lesson then the visual aid will help pupils recall the information and fix it into their memory. If they are new pictures then the pupils will have to give a bit more thought, which also helps. If unrelated pictures are used it can have two outcomes, both of which promote good thinking skills. The first is simply that they have to be selective and think a little more independently. The second outcome is that occasionally pupils will make a new connection or demonstrate some metaphorical thinking, both of which display high level skills. If pupils are writing this up, you can add an evaluative element by letting them choose just one picture that they judge as being representative of the most important point of the lesson. They should then justify their choice. You can set this challenge to students in pairs or small groups and ask who can link the most pictures to the lesson. 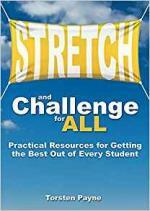 You can find more tried-and-tested strategies for playing to the strengths of all learners in my latest book: Stretch and Challenge for ALL: Practical Resources for Getting the Best out of Every Student (Crown House Publishing).